The Schweizerhalle disaster happened in December 1986. On 1st December 1986, a fire broke out in the warehouse of a chemical plant owned by the Sandoz firm in Schweizerhalle, near Basel (Switzerland). The explosion and combustion of phytosanitary products quickly formed a chemical cloud of mercapatan (thiol), which alarmed authorities. The authorities implemented a disaster plan. Fire-fighters poured 15,000 cubic metres of water into the area to attempt, in order to stop the fire and the formation of the cloud. This created a second form of pollution: the massive quantity of water mixed with 1,200 tonnes of insecticides and pesticides, 15 tonnes of Berlin Blue and Rhodamine B (colouring), and 2 tonnes of mercury. This was much more than the 50 cubic metre retention basin could hold. Toxic red streams flowed into the Rhine. The Swiss authorities then isolated the river from other watercourses and the water distribution networks. Fishing was prohibited in the Rhine for 6 months and a measuring and monitoring campaign was implemented. Located along the Rhine, France, Germany and the Netherlands were also affected by this chemical pollution, but information was not passed along in a satisfactory manner. Countries therefore reacted too late. The explosion may have been caused by the self-combustion of Berlin Blue, which can burn for hours without producing flames or odours. Another hypothesis is that a bottle of propane was not stored properly. Whatever its cause, the disaster, and the resulting red water and tonnes of dead fish, served as a wakeup call. New measures already reinforces protection for plants against major accidents. 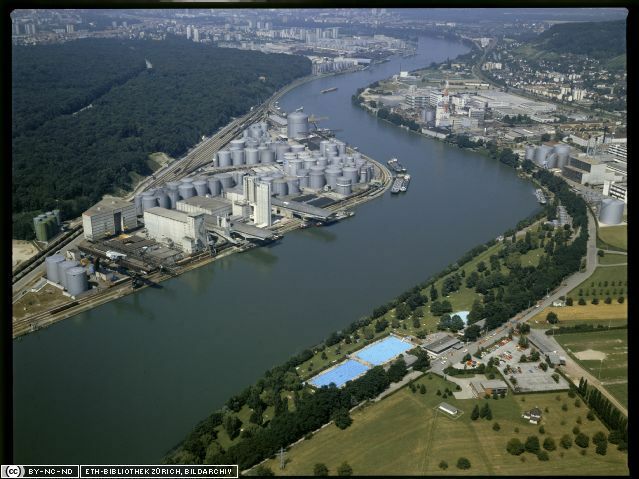 Henceforth, businesses located along the Rhine, which store chemical substances in the drainage basin of an international water course, must take measures to protect against this type of accident. The international alarm system, which proved to have failings, was also restructured so that anti-pollution measures reduce the amount of waste that flows into the river. 20 years after the disaster, the target of reducing pollutant matter is obsolete, but problems remain concerning pollution from heavy metals, pesticides and hormonal substances produced from medication (contraceptive pill, etc.). 20 years later, the Rhine has recovered its ecological functions and appearance. The river is healthier than before the pollution.